Copyright © 2013 Silvia Magalhães Couto et al. This is an open access article distributed under the Creative Commons Attribution License, which permits unrestricted use, distribution, and reproduction in any medium, provided the original work is properly cited. Objective: To expose the likely impact of genetically modified foods in Collective Feeding. Methods: This was a case study conducted on a steel company (SC) in Rio de Janeiro State. The likely impact recognition began with the preparation of a soy food products’ list. Then, we verified these products’ frequency on the Food and Nutrition Unit (FNU) menu from the SC, outlining the offer profile. We calculated odds ratios and binomial distribution probability for assessing exposure to soy that may be transgenic. Food frequency questionnaire (FFQ) regarding soy products was applied. The convergence of daily products’ relative frequency of this population and the population from a reference study about FFQ validation in Rio de Janeiro was verified. Confrontation took place between the classification of foods by the consumers’ likely exposure to soy and the percentage deviation between observed relative frequency of products’ intake offered on the FNU and on the reference study. Results: A list of 51 products were created and 16 of them integrated the menu, e.g. flour, chicken, sausage, maize, instant pudding, bologna, hot dogs and peanuts. Food usually consumed by FNU users and concomitantly consumed in reference study were cookies, flour, spaghetti, bread, cake, instant pudding, sausage and hot dogs. By the classification and percentage deviations results, cookies, breads and pasta were the “villains” of soy’s susceptibility. Conclusion: It was possible to show the likely impact of genetically modified foods in Collective Feeding, confirming that these consumers were exposed to soybeans that may be transgenic. Close to the decade in which the Brazilian Government proposed the National Food and Nutrition Policy (PNAN) liberated genetically modified soybean (Roundup Ready-RR) for commercialization and planting through the Biosafety Law No. 11.105, of 24/03/2005  and the National Technical Commission on Biosafety (CTNbio) approved to importation of genetically modified maize, the Collective Feeding (CF) area directly suffered such actions. The CF is characterized by the production process of meals with sanity level required by the law of the country, whose reason for being is its responsibility to public health . The consumers’ consumption pattern has changed due to concerns about health, quality of life and environment. Simultaneously, there are innovations in biotechnology as the use of transgenics for food production. Transgenic plants are those that have a new gene or a DNA fragment inserted into them by the process of genetic engineering or recombinant DNA . Plant breeding researches have been developed in an attempt to improve the nutritional quality of soybeans, for greater acceptance and digestibility, without however affecting its nutritional and functional properties [4,5]. The United States, Brazil and Argentina are the largest producers of transgenic soybeans, and Brazil is in second place right after the United States . To evaluate the safety in use of genetically modified plants as food source, it is vital to establish their ability to accumulate toxic to humans and animals and to recognize whether pleiotropic and transgenic constructs can lead to accumulation of other harmful metabolites and allergens. Most pesticides are toxic to humans, for example, glyphosate, which is potentially carcinogenic and can cause lymphoma . The labeling of genetically modified (GM) foods is expected because of the Consumer Protection Code (Law No. 8078 of 11/09/90 - art. 6, III and art. 8˚)  and Decree No. 4680 of 24 April 2003 . It is a regulation to assure citizens information on food product and enable them to make an informed decision about what to buy . Moreover, it enables traceability because in cases of effects on human health, labelled food products would be easily identified and collected. Thus, it is of utmost importance that food manufacturers realize that labeling should represent an important tool to clarify the origin of the grain used in the occurrence of transgenic soybeans in the case of the emergence of public health problems. The consumers’ cognition interferes with the intent to purchase the food product . There are two aspects in this regard: the first relates to the ignorance of the consumer in the widespread use of soy as an ingredient in many food products sold in the retail market. So those products may be transgenic or not. The second concerns the lack of democratization of knowledge in relation to transgenics in Brazil, hampering the consumer to formulate concepts and to decide whether to purchase food products that will form their eating habits. While the topic is discussed in the scientific, technical, political, economic, social and philosophical range, it is believed that the consumer, including the CF users, remains uninformed and consuming soy in their usual diet . Therefore, the aim of this study is to show the likely impact of GM foods in the CF. This study was approved by the Ethics Committee on Research involving Human Subjects of Gama Filho University (protocol 009/JUL/2006), observing compliance with the ethical principles contained in the Declaration of Helsinki of the World Medical Association. The research is characterized as a case study, in which data were collected in a survey in steel company (SC), located in the city of Volta Redonda in the state of Rio de Janeiro. Volta Redonda is a city with about 259,000 inhabitants and it is a strategic area, because its location is 310 km from São Paulo, Brazil’s largest city, and 127 km from the city of Rio de Janeiro, the second largest national metropolis and state capital. Volta Redonda is also known as the “Steel City” for housing the National Steel Company. The Food and Nutrition Unit (FNU) was outsourced and classified as a large unit, according to the Ministry of Labor and Employment . There are served large meals, lunch and dinner meals that constitute meals with higher energy intake and a small meal (supper), which has a lower energy intake and is provided as a late night snack. The menu structure of the large meals is characterized by the entrance, consisting of five to two salads; main course; side option; garnishes, side dish (rice and beans), a dessert and milk or fruit juice. The small meal is composed of two sandwich options, a fruit, two choices of soup and sugary food. We have created a food frequency questionnaire (FFQ) using the information on food preparations and products containing soy as an ingredient declared in labels identified on the menu of the Food and Nutrition Unit from the SC. The consumption frequency was defined by the following gradient scoring categories: never 1), rarely 2) once a week 3), twice per week 4) three times per week 5), daily 6). The main items included in the FFQ were: corn starch, pastry dough, soy sauce, soy yogurt, French fries (frozen), cookies, pasta for lasagna, mustard, cream cheese, straw potatoes, cake, dough for rolling, seasoning paste, fruit juice (box), industrialized cake, oatmeal, pancake doug, torrone, soy milk fruit Juice, processed farofa, cornmeal, pizza dough, Japanese peanuts, peas (canned), salad dressing, cassava flour, bread, whipped cream, cocoa beverage, microwave popcorn, breadcrumbs, ketchup, vegetable cream, corn (canned), pudding, wheat flour, garlic sauce, mayonnaise, tomato pulp, instant mashed potatoes, wholemeal, pepper sauce, margarine, sardines (canned), pies, pasta, English sauce, powdered milk and chicken strips. The FFQ, after validated in a restaurant in Rio de Janeiro (manuscript on evaluation stage), was replicated in the steel company (SC) including the employees and contractors in the food sector, both users of the CF service. The possible FNU users constitute a population group of approximately ten thousand employees. The pilot sample was of 100 individuals. This sample for discrete data in finite populations had parameters accuracy of 10%, p = 0.50 and confidence level of 95% . When the questionnaire was applied in the SC, the pilot sample size was reduced to 89 individuals, because they have only granted us permission to stay a single day during the period from 9:00 to 17:30 pm, for public security reasons. Thence, we were not able to reach 100 or more participants. To calculate sampling error for discrete data in finite populations, in the application of FFQ, we used percentage “p” of individuals who consume the food daily divided by the total number of individuals in the sample, a confidence level of 95%, n = 89 and N = 10,000. The maximum sampling error, 7.41 for foods on the list did not exceed 10%. First, we elaborated the list of food products that contain soy in their formulation. The verification of these products was carried out by visits to large supermarket chains in the city of Rio de Janeiro. The supermarkets cadastral investigation was carried out using websites that provided the addresses of its locations, distributed across neighborhoods grouped by central, south, north and west zones. We did it because people from different areas have different incomes, which also lead to differentiated food products supply in supermarkets. The inclusion criterion of products on the list was based on food products, whose raw material was soy, in the form of food additive or ingredient of the product formulation declared on the label. This option rests on procedures used in identification of transgenic soybean in food products . Then we investigated the frequency of food products containing soy in their formulation on the menu of the FNU of the SC. The SC provided the menu used for a month, with no need to check menus of subsequent months, due to the low diversity of preparations, subject to large production process. Next, we sought possible ingredients of dishes in recipes. We asked the nutritionist to enroll ingredients used in the elaboration of food preparations and to list which food products were processed and which ones were prepared within the own FNU. In case of processed food, we could immediately find their ingredients looking at the previously completed list. In case the food were prepared in the FNU, it would be necessary to investigate the preparation technical cards. We have planned to investigate the offer frequency of food products with soy that were present in the menu for 31 days. This study applied the relative frequency of soybean use for each weekday from the menu structure items by type of food product, allowing us to check the representativeness of soybeans within 31 days of the menu, considering the possibility of offering and the made offer. The construction of the profile generated data necessary to calculate the odds ratio and simultaneously binomial distribution probability for assessing exposure to soy that may be transgenic. We investigated habitual food consumption of food products containing soy in their formulation in users of the FNU from the SC. A FFQ was constructed using food products containing soy declared as an ingredient on the label, identified previously in supermarkets. The FFQ is a dietary assessment instrument for use in population based strictly on frequency with which foods are consumed . The FFQ was previously validated (manuscript on evaluation stage), reaching Spearman correlation coefficient (r) of 0.77 with a deviation of 0.6136 to 0.8642 (p < 0.0001). The Cronbach coefficients were 0.88 and 0.79 for both groups in the study. According to the method of Bland & Altman  we could verify the agreement in the responses of the two groups and the overall Kappa value was of 0.614. After the FFQ was validated, we applied it to the SC, allowing comparison with a reference study in FFQ  in Rio de Janeiro, in order to verify convergence of the relative frequency of food consumed daily in both populations. If the frequency observed in SC was higher than that found in the study reference , it meant that SC users could be subjected to greater exposure to GM food consumption. The verification of the likely impact of soy on CF was held by the confrontation between the classification of food products by the likely users exposure to soy that can be transgenic and the percentage deviation verified between the relative frequency of consumption (habituation) of food offered in the SC and the its presence in the reference study of FFQ in Rio de Janeiro . If this difference was positive, the SC users should be more exposed to transgenic soybeans than the population of Rio de Janeiro. To point out the exposure of FNU users to soybeans that can be transgenic, the binomial distribution, b (n, x, p, q) was used considering the presence of the food product according to its frequency of use in the 31 days of the menu. In the case of the odds ratio was obtained proportion of frequency of use within 31 days, which divided by the complement of this ratio shows the number of times of this occurrence. If the probability is 1, it means that we have an assured event that this food will be offered on the menu. Remembering that this food contains soy as an ingredient in or an additive, and it may be transgenic. Due to the variety of ingredients used to elaborate food preparations for a month, the odds ratio could not reach values in the neighborhood of 1, because the proportion frequencies tended to be low values. In this case, the decision is provided by the gradual odds ratio, that I the quantitatively number of times that corresponds to the occurrence chance of success. We developed five classes of possibility sectioned in multiples of 0.25 (UL = unlikely to 0.25, L = likely, from 0.26 to 0.50, VL = very likely, between 0.51 and 0.75 and ML = most likely, greater than 0.75) by segment delimited by the interval (0,1). The list of food products developed through labels reading, disregarding brands and varieties, totally 51 products. Of these, 16 were found on the menu of the FNU of the SC as food products (e.g. cake, cookies, bologna) or as preparation ingredients (e.g. flour, soy sauce, soybean oil). Regarding the frequency of soy on the menu (Table 1), findings showed that large meals get bigger share of food products and ingredients with the presence of soybean (n.238) than Supper (n.199). In the large meals, the menu structure that had more ingredients or food products with soy was the side option with 26.47%, followed by the side dish (25.63%), main course (21.43%) and garnish (20.59%). At supper, the soup, option 1 and sugary food 2 contribute to greater participation of ingredients and food products with soy, 35.18%, 32.14%, 23.81%, respectively. Looking over the food preparations, in the large meals, 56.00% of the side option had soy in its compositionfollowed by the garnishes and the side dishes both with 50.00%. At supper, in the side option 1 and 2, all of the preparations served had soybeans in its composition. In the sugary food 2 and the soup, 75.00% and 71.43% of the preparations had soy. The sugary food 1 was the one which had fewer preparations with soy (one), since other preparations in this structure are based on fruits. Therefore, we realize that soy is widely used by the food industry in the processing of food products presented in the CF menus as products or ingredients of preparations. It is used for several purposes and can be found in the labels as soy protein, textured soy protein, concentrated soy protein, isolated soy protein, soy lecithin, vegetable protein, hydrolyzed vegetable protein and soy extract. The ANVISA (National Agency for Sanitary Vigilance) Board Resolution (RDC) no. 268 of September 22, 2005 “Technical Regulations for Protein Food products of Animal Origin”  states that food products should present in its composition the following levels of protein in 100g: textured soy protein—less than 50%, concentrated soy protein—at least 68%, isolated soy protein, minimum 88%. With respect to soy extracts, powder— less than 40%, defatted soy flour—at least 45%, hydrolyzed vegetable protein—at least 25%. Thus, justifying the various nomenclatures. 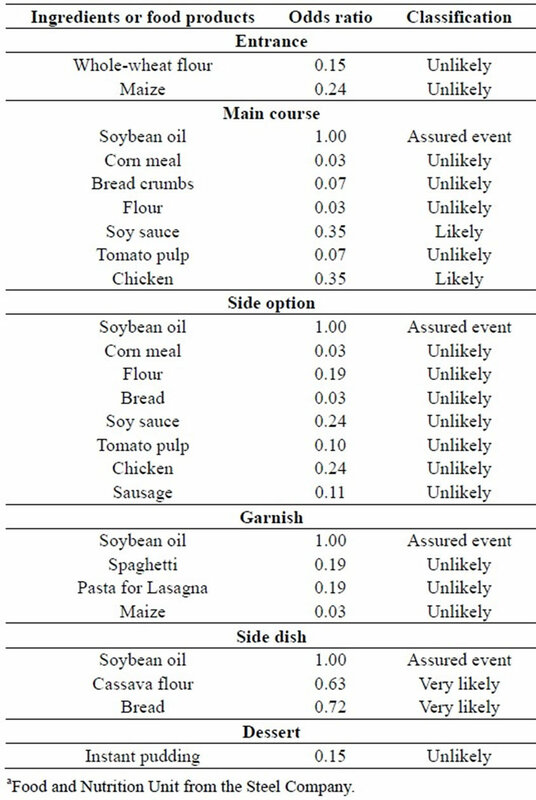 By the menu analysis, based on the binomial distribution (Tables 2 and 3), we verified that only soybean oil can be considered an assured event in the consumption habituation of large meals, with the exception being the menu structures entrance and dessert. At supper, we had other than the soybean oil as an assured event, which were the bread (soup) inside option 1 and 2. Table 1. Soybeans participation in the menu of the FNU from the SCa, Rio de Janeiro. Table 2. Odds ratio of exposure of the FNU users from the SCa to ingredients or food products containing soy in large meals (lunch/dinner). Table 3. Odds ratio of exposure of the FNU users from the SCa to ingredients or food products containing soy at supper. The odds ratio for the large meals showed that cassava flour and bread were classified, in relation to the users exposure to soy as “very likely” on the side dishes, followed by the chicken and soy sauce as “likely” on the main course. At supper, noodles (soup) and bologna (side option 1) were classified as “most likely”, chicken (soup) was classified as “very likely”, and hot dogs (side option 1), cookies, cake and peanut (sugary food 2), as “likely”. The remaining ingredients and food products were classified as “unlikely” in both large, as in the small meals. Despite efforts in the pursuit of information of consumption habituation in the state of Rio de Janeiro, only a study of FFQ  allowed us to confront some of the products that participated in the preparations of the food menu. The frequency of daily consumption of these was compared with daily frequency of reference study data . The positive deviation between these relative frequencies were found for all confronted food products, especially cookies (consumption 43.00% higher than in the reference study) . With the exception of cassava flour (percentage difference of 6.00%) and instant pudding (percentage difference of 5.00%), other products were between 21.00 and 26.00 percentage deviations. We compared the food frequency consumption in study with the classification by the odds ratio (Table 4). The cookies other than obtaining greater deviation of the relative frequency (43.00%) had also been classified as “likely” exposure to soy, that may be transgenic. The bread had a deviation of 26.00% between relative frequencies and was classified as assured event observed at the supper (side option 1 and 2). 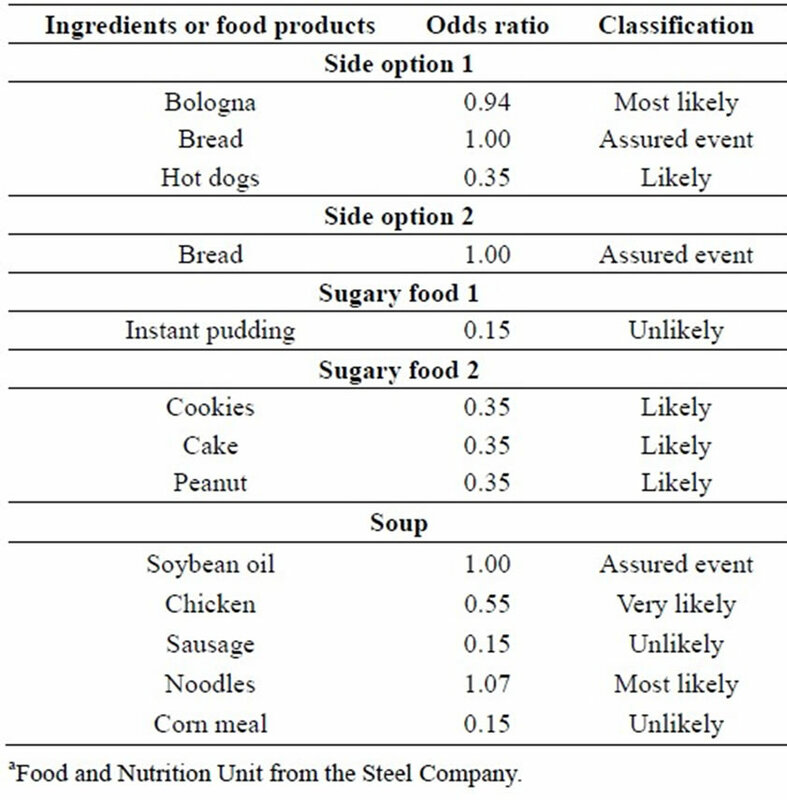 The spaghetti presented with percentage deviation close to the hot dogs and cake, 25.00%, 24.00% and 21.00% respectively, and was classified as “Most likely”, while others, as “likely”. The cassava flour was rated as “very likely”, but with a deviation of 6.00%. The sausage with deviation identical to cake was classified as “unlikely”, the same as instant pudding with very low percentage deviation frequency (5.00%). From the results of classifications and percentage deviations based on the reference study of FFQ , we can consider some food products or ingredients as “villains” for susceptibility to soybeans that can be transgenic in CF: cookies, classified as “likely” because of the significant percentage deviation pointing that its use in CF is more present than its daily consumption estimates. Similarly, we had the bread with deviation of 26.00%, but being classified as assured event on the menu, followed by pasta (25.00%) classified as “most likely”. Note that among all considered “villains” of susceptibility to soybean, the bread has a high consumption habituation (80.90% in the SC and 54.90% in the population estimate). Table 4. Confrontation of the food frequency consumption of the FNU users from the SCa with the classification by odds ratio. Despite of not being included in the questionnaire of the reference study , soybean oil can also be considered as a “villain” because it was classified as an assured event on the following menu structures: main course, side option, garnish, side dish and soup. The annually household food acquisition per capita verified by the Household Budget Survey (POF)  from the Brazilian Institute of Geography and Statistics (IBGE) showed the following consumption: 21.791 kg/year of breads (59.701 g/day approximately one unit of French bread), 4593 kg/year of cookies (12,584 g/day approximately three units) 5.174 kg/year of pasta (14,175 g/day approx a dessert plate of cooked pasta) and 4.713 kg/year of soybean oil (12,912 g/day approx one table and one dessert spoon). Compared to these study results, we can infer about the likely impact of soybeans, susceptible of being transgenic, in the CF. These findings are relevant because the CF is set in a sector of the economy characterized by users that regularly attends the productive unit. Therefore, at the mercy of captivity supply of food for their consumption, and in general, the use of this service in the long term . Food products chosen in this study as “villains” have inclusion of soy in their formulations regulated by the Ministries of Health, Agriculture and Supply. The National Agency for Sanitary Vigilance (ANVISA) through RDC No. 263 of September 22, 2005  in their general requirements determines that the use of plant species may be authorized if proven its safe usage. Importantly, this RDC is valid for all food products from cereals, starch, flour and bran, like pasta, breads, cookies, which means that these products can be obtained or derived from wheat and other cereals, legumes, roots and/ or tubers. This procedure is so routine for the food industry, that it already existed the Ordinance No. 354, of July 18, 1996  which determined ANVISA minimum quality requirements that must be satisfied in flour, being allowed use, as an optional ingredient, of 1% to a maximum of soybean flour. This Ordinance was repealed by the RDC cited earlier . The Brazilian Ministry of Agriculture has existing Ordinance No. 224, of April 5, 1989  allowing the use of food products derived from cereals, legumes, roots and tubers for human consumption, in partial or total replacement flour wheat, in the preparation of breads and cookies, and partial replacement, in pasta. In relation to food products of animal origin such as marinated poultry (“likely”) and mechanically separated meats, sausages (“unlikely”) and hot dogs (“likely”), the Brazilian Ministry of Agriculture and Supply legislates them through the Normative Instruction n˚. 89 of 17 December 2003  and No.4 of March 31, 2000 , respectively. In both of them it is allowed the use of optional ingredients such as proteins of vegetable origin. The concentrated, textured and isolated soy proteins are used in marination process in marinated poultry due to their functional and emulsifier properties and the ability to increase water retention with subsequent improvement in texture of the final food product [26,27]. To analytically identify if soy used in food products is transgenic or not or to identify possible contamination in the production chain, the most appropriate technique for this purpose is the Real-Time Polymerase Chain Reaction (PCR). This method allows the estimation of the initial amount of the amplified DNA (deoxyribonucleic acid) . Brod et al. , Greinerh & Konietzny  and Cardarelli et al. analyzed food soy marketed in Brazil, by quantitative real-time PCR and found that 51.00%21.00% and 18.00% had RR soybean, respectively. Among which, they found soy flour, instant soups, isolated soy protein, food for vegetarian diets, bakery products, pasta and cookies considered “villains” in this study. Given the fact that food products designated for analysis usually have had some type of processing that can interfere with the integrity and quantity of the target analyte (e.g. protein or DNA), it is necessary to consider possible sensitivity interference, whatever the method . In RR soybean, processes such as grinding, cooking, coagulation, dehydration and homogenization result in DNA degradation, and endogenous DNA fragments are more stable than exogenous genes, factors that may influence detection analysis and identification/quantification of GM organisms . Malatesta et al. observed, by ultrastructural analysis and immunocytochemistry, changes in the pancreas, testicules and liver of rats subjected to RR soy intake and there is a possibility that such effects related to the accumulation of herbicide present in the resistant soybean . This demonstrates a possible health risk that uninformed CF users may be vulnerable. The present study has some limitations. We were only able to identify products with soybeans as an ingredient by the label. But there are products that do not declare the soy use, because of the small quantity use. We were not able to identify those products. Another limitation was the use of a FFQ that required the memory of its respondents. Other than that, we already mentioned that the SC only granted us permission to stay a single day for the FFQ application. Thence, we were not able to reach 100 or more participants. Despite those limitations, the study found very interesting results. For future studies, we suggest the analyses of the food included in the FFQ to check for the prevalence of transgenic soybeans on it. Therefore, soy is widely used by the food industry and consequently, for human consumption, a fact that is confirmed in this study. As food products that have soy in their composition are assured events (soybean oil and bread), most likely (noodles), very likely (cassava flour, bologna, chicken) and/or likely (cookies, soy sauce, hot dogs, cake and peanut) to occur on the SC menu, its users become exposed to soy that can be transgenic. These products were also found with high purchasing in annually household per capita from the POF  for the population of Rio de Janeiro, making it imperative to develop techniques increasingly accurate for identifying transgenic soy in food products and monitoring herbicide glyphosate in their grain. Presidency of the Republic. Law No. 11.105, of March 24, 2005. Regulates sections II, IV and V of § 1 of art. 225 of the Federal Constitution, establishes safety standards and mechanisms for monitoring activities involving genetically modified organisms - GMOs and their derivatives, creates the National Biosafety Council - CNBS, restructures the National Technical Commission on BiosafetyCTNBio, provides for a National Policy Biosafety - PNB, repealing the Law No. 8974 of January 5, 1995, and the Provisional Measure No.2191-9 of August 23, 2001, and the arts. 5, 6, 7, 8, 9, 10 and 16 of Law No. 10.814, of December 15, 2003, and other provisions. Lajolo, F.M. and Nutti, M.R. (2003) Transgênicos: Bases científicas da sua segurança. Sociedade Brasileira de Alimentação e Nutrição (SBAN), São Paulo. Cardoso, L.R., Oliveira, M.G.A., Mendes, F.Q., Pires, C.V., Ribeiro, F.R., Sant’ana, R.C.O. and Moreira, M.A. (2007) Inhibitors protease activity in soybean lineages improvement. Alimentos e Nutrição Araraquara, 18, 19- 26. Kuliov, A.M. (2005) Genetically modified organisms and risks of their introduction. Brazilian Journal of Plant Physiology, 51, 99-111. Brazil, Consumer Protection Code, Law n. 8.078 of September 11, 1990. Provides for consumer protection and other measures. Brazil, Decree No. 4680 of April 24, 2003. Regulates the right to information, provided by Law No. 8078 of September 11, 1990, regarding food and food ingredients for human consumption or animal feed containing or produced from GMOs, without prejudice to compliance with other applicable rules. Morales, B.S., Bravo, O.S., Fuentes, D.R. and Coria, M.D. (2008) Differentiated perception of transgenic tomato sauce in the southern Chile. Archivos Latinoamericanos de Nutrición, 58, 49-58. Brazil Ministry of Labour and Employment (2001) Program worker food: Legislation. 4th Edition, DF, Brasília. Rodrigues, P.C. (2002) Bioestatística. 2nd Edition, EDUFF, Niterói. Sichieri, R. (1998) Epidemiologia da obesidade. UERJ, Rio de Janeiro. Brazil, the National Agency for Sanitary Vigilance. Board Resolution (2005) RDC No 268 of September 22, 2005. Technical Regulations for Protein Food Products of Animal Origin. Brazil, IBGE (2008-2009), Research Board, Coordination Price Indexes, Household Budget Survey (POF). Lanzillotti, H.S. (2002) An application of food technology in collective feeding. Higiene Alimentar, 16, 16-25. Brazil, the National Agency for Sanitary Vigilance. Board Resolution (2005) RDC No 263 of September 22, 2005. Technical Regulations for Food Products of Cereals, Starches, Flours and Bran. Brazil, the National Agency for Sanitary Vigilance (1996) Ordinance No. 354 of July 18, 1996. Approves the Technical Standard regarding Wheat Flour. Repealed by RDC No. 263 of September 22, 2005. Technical Regulations for Food Products of Cereals, Starches, Flours and Bran. Brazil, Ministry of Agriculture and Supply. Secretary of Defense Farming (1989) Ordinance No. 224 of 05 April 1989. Allow the use of food products derived from cereals (maize, sorghum, rice, rye, barley and oats), legumes (soy, beans and chickpeas), roots (cassava) and tubers (potatoes, yams, taro), aimed for human consumption in partial or total replacement for wheat flour in the preparation of breads and cookies, and partial replacement, in pasta. Brazil, Ministry of Agriculture and Supply. Secretary of Defense Farming (2003) Normative Instruction No. 89 of December 17, 2003. Technical Regulation of Identity and Quality of Marinated Poultry. Brazil, Ministry of Agriculture and Supply (2000) Secretary of Defense Farming. Normative Instruction No. 4 of March 31, 2000. Technical Regulation of Identity and Quality of Mechanically Separated Meat of Bologna, Sausage and Hot dogs. Fontan, R.C.I., Rebouças, K.H., Veríssimo, L.A.A., Machado, A.P.F., Fontan, G.C.R. and Bonomo, R.C.F. (2011) Inﬂuence of kind of meat, addition of phosphate and texturized soy protein in cooking weight loss and downsize of hamburgers. Alimentos e Nutrição Araraquara, 22, 429-434. Barros, N.E., Oliveira, E.M.M. and Marin, V.A. (2008) Applicability of the real-time polymerase chain reaction based-methods in quantification of genetically modified organisms in foods. Brazilian Journal of Nutrition, 21, 85-92. Malatesta, M., Tiberi, C., Baldelli, B., Battistelli, S., Manuali, E. and Biggiogera, M. (2005) Reversibility of heaptocyte nuclear modifications in mice fed on genetically modified soybean. European Journal of Histochemistry, 49, 237-242. ANVISA—National Agency for Sanitary Vigilance; CF—Collective Feeding; CTNbio—National Technical Commission on Biosafety; DNA—Deoxyribonucleic Acid; FFQ—Food Frequency Questionnaire; FNU—Food and Nutrition Unit; GM—Genetically Modified; IBGE—Brazilian Institute of Geography and Statistics; L—Likely; ML—Most Likely; PCR—Polymerase Chain Reaction; PNAN—National Food and Nutrition Policy; POF—Household Budget Survey; RDC—Board Resolution; RR—Roundup Ready; SC—Steel Company; UL—Unlikely; VL—Very Likely.